Parents whose children who are being treated with medication for ADHD have particular feeding challenges. The medication spoils children’s appetites, children eat poorly, and parents worry that their child’s growth will be stunted. Often, parents and their children with ADHD have fights when parents try to get children to eat more than they are hungry for. Those very fights spoil the feeding relationship, take away children’s good feelings about eating, and undermine their ability to know how much they need to eat. It could well be true that children with ADHD are more likely to be overweight, obese, and have an eating disorder. But it need not be so. The problem is the food fights, not the ADHD itself. The division of responsibility in feeding (sDOR) and being family friendly with feeding works for children with ADHD, the same as for every other child. Even more than other children, children with ADHD are helped to focus and attend to eating when parents faithfully do the what, when, and where of feeding, and scrupulously trust children to do the how much and whether of eating. Children can be trusted to make up for their food needs. In the evening, when the meds wear off, they are likely to be hungry and eat a lot. They do the same any time they are off the medication, even if it is weeks or months later. 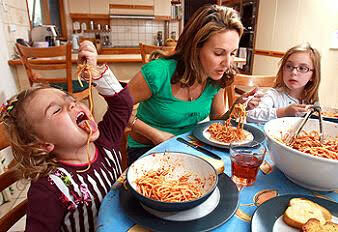 Through your child’s ups and downs with eating, stick with sDOR and don’t panic. sDOR helps stabilize all children, and it particularly helps stabilize children who may have difficulty focusing. Your child’s body remembers how much it needs. Given her generally poor appetite, she will benefit from reminders to consider eating, which is where the regularly scheduled meals and snacks come in. You might provide the meals, or you might remind her to provide them for herself when she is on her own. When you follow sDOR, even with all the ups and downs in eating, your child will likely eat what she needs and maintain steady growth – or correct back to her normal growth curve after the medical issue is addressed.